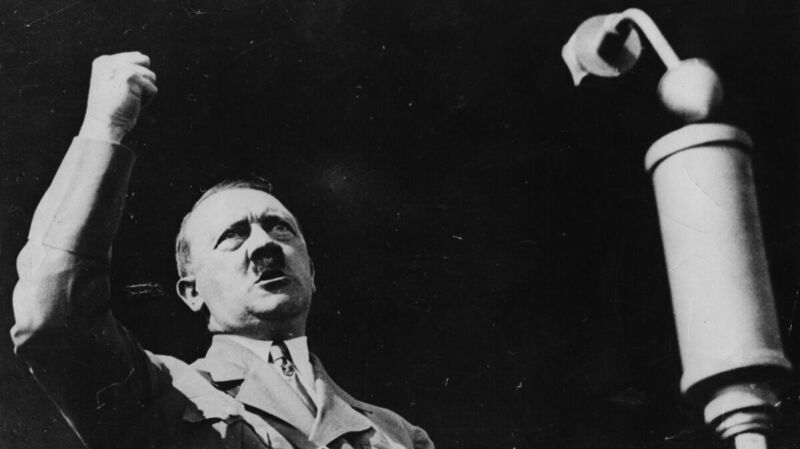 Book News: Hitler As A Comedian? Comic Novel Tests Limits Of Humor : The Two-Way New rules in the U.K. ban people from sending books to prisoners; the best books coming out this week. Adolf Hitler, pictured delivering a speech circa 1936. Adolf Hitler wakes from a coma to find himself in modern-day Berlin, where everyone assumes he's a comedian who never breaks character — and so the Führer becomes a novelty act, a YouTube sensation (the "loony YouTube Hitler") and then eventually a celebrity and politician. This is the premise of the German satirical novel Er Ist Wieder Da (Look Who's Back) by Timur Vermes, which is about to be published for the first time in English. The book has sold more than a million copies (and spurred furious debate) in Germany. Although many critics in Germany found the book tasteless, Vermes told The Guardian that it contains a serious warning: "If [the book] makes some readers realise that dictators aren't necessarily instantly recognisable as such, then I consider it a success." The book will be released next week in the U.K. — it doesn't appear to have a U.S. publisher yet — and will test how comfortable English-speaking audiences are with laughing about Hitler. Rules in the U.K. ban people from sending books to prisoners. The restriction apparently went into effect in November, but the news went viral over the weekend. In an op-ed, the Horward League for Penal Reform's Frances Crook wrote that "punishing reading is as nasty as it is bizarre." In Laura Kasischke's psychological thriller Mind of Winter, Holly Judge wakes up on Christmas morning with the sentence "Something had followed them home from Russia" echoing around her skull. Alone in the house with her daughter, Tatiana, Holly becomes increasingly convinced that something is wrong – that Tatiana isn't the girl she picked out in a bleak Siberian orphanage 13 years ago. A blizzard keeps mother and daughter trapped in the house together, as Holly's narrative becomes more and more confused, with dark hints of a psychotic break. Though understated, Mind of Winter is leave-the-lights-on-tonight frightening, with a quiet edge of horror that is much more effective than gore. Published in Nigeria in 2007, Teju Cole's Every Day Is for the Thief is being released in the U.S. this week. A lean and careful portrait of Lagos from the perspective of an unnamed narrator, it describes the city's everyday corruption, from the police to the woman who sells fuel at the gas station. One of the most arresting sketches is of the "yahoo yahoo," who spend their time in internet cafes writing email scams: "Once, looking to my right in an internet café ... I see a letter being written from the 'Chairman of the National Office for Petroleum Resources.' The writer is a rough-looking man who is clearly chairman of nothing. There are other letters, from the heirs of fictional magnates, from the widows of oil barons, from the legal representatives of incarcerated generals, and they are such enterprising samples of narrative fiction that I realize Lagos is a city of Scheherazades. The stories unfold in ever more fanciful iterations and, as in the myth, those who tell the best stories are richly rewarded."